The idea for this Site came up AFTER the cancellation of the 1994 World Series...eight years later, we all know IT COULD HAPPEN AGAIN!!! If Fans aren't PROACTIVE, ORGANIZED, UNITED AND COMMITTED, the odds of it happening again go up drastically!! Are you going to help "Save Baseball from itself" or are you gonna have the "It won't work" attitude? "I would NEVER do ANYTHING to make baseball look FOOLISH!" "Opening Day" in Marinerville is one week away. But it's not just "ANY Opening Day." It's the "25th Anniversary Season-first afternoon opener in Mariner history-Opening Day." But it's not just "ANY 25th Anniversary Season-first afternoon opener in Mariner history-Opening Day." It's the "25th Anniversary Season-first afternoon opener in Mariner history-AGAINST the only team to fix a World Series-WITH the only man to cancel one-PRESENTING the Commissioner's Historic Achievement Award-IN the city he snatched baseball from-ON April Fools Day-Opening Day." It's the "Perfect Opening Day" to kick off All-Star Fan Protest II. Last season "seemed perfect" for the All-Star Fan Protest. The All-Star Game was in Seattle. The Official Sports Fan Union is based in Seattle. There's a great sports radio station in Seattle. And the Collective Bargaining Agreement was set to expire at the end of the season. The stage was set. With the help of sports radio, "the Protest" was getting 100,000 Fans in each MLB city, UNITED to take a proactive stand to "PROTECT the GAME." Three million Fans asking Major League Baseball, "Guess who's coming to the table?" But the Mariners shot outta the gate on their way to 116 wins. KJR didn't want to talk about anything, BUT going to the World Series and its "own Fan Initiative" for putting all Mariners on the AL All-Star Team. So the All-Star Fan Protest didn't get rolling. The Mariners didn't go to the World Series. And Initiative 950 didn't matter. The A.L. All-Star Team was virtually the Mariners anyway. Kings of the 2001 Series! After the season, the Collective Bargaining Agreement expired. 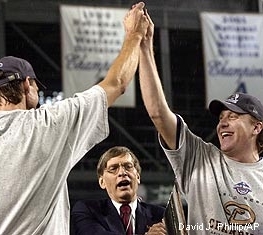 Two days after the greatest World Series EVER, commissioner Bud Selig announced plans to contract two teams. Then Bud went before a Senate Committee and anyone watching would swear under oath, he basically testified to his ineptness as commissioner. Then as if he was trying to confirm it, Bud got caught in an illegal loan. Was that before or after, he dangled a franchise in front of Washington D.C.? For a guy who was "trying to keep things quiet," Bud seemed like he was on an off-season World Tour. Bottom line, if THREE MILLION FANS were UNITED and DEMANDING to be at the Collective Bargaining Table, the "most uncool commissioner in sports history" wouldn't be acting like he's Frank Sinatra belting out, "My Way." Fool of the 2002 Series? Bud Selig will be in Seattle on Opening Day. The All-Star Game in Milwaukee is 99% (the one percent stems from the dates July 8-10 obviously reserved on all Official MLB Websites, but "All-Star Break" is curiously omitted) sure to go on without a hitch. Besides those two events, there is no telling what the Commish will do during the 2002 Season. By the end, everything could be up for grabs. Bud Selig cancelled the 1994 World Series because there wasn't THREE MILLION FANS UNITED to stop him! 100,000 Fans in each Major League City, UNITED by the "Voices of Reason" of 30 sports radio stations, organized by Democracy, will keep Bud Selig from doing anything crazy. Hell, it might even get him ousted as commissioner! It's put or shut up time baseball Fans! Opening Day is April 1. Who's gonna be the Fool this season? Bud or the Fans? Baseball Fans, get with the WeTheFans.com All-Star Fan Protest II and let's shoot for 1.5 million by the All-Star break! 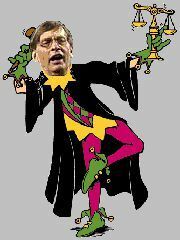 Bud Selig didn't wait until March MADNESS to go MAD! He went MAD right after last season's World Series and has been on a MAD Man World Tour ever since!! 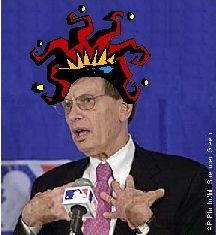 The owners won't stop him...the players won't agree to a salary cap...the MLB Fans are financing "The Show" and thereby the only ones who can break the tie...so let's INTERVENE...STIR UP THE DUST...and SETTLE IT ONCE AND FOR ALL!